Diabetes is a common disease in the United States and the most common cause of blindness in the US. Regular eye examinations are important in diabetes because diabetic eye disease and the vision loss caused by it are completely preventable. In diabetes, high sugar levels in the blood damage blood vessels throughout the entire body. Damage to blood vessels in the kidneys can cause kidney failure requiring dialysis. Your eye also has many blood vessels in it, and diabetes can also damage those blood vessels in the retina of the eye. The retina is a thin layer of light-sensitive tissue that lines the back of the eye. Light rays are focused onto the retina, where they are transmitted to the brain and interpreted as the images you see. The macula is a very small area at the center of the retina. It is the macula that is responsible for your pinpoint vision, allowing you to read, sew or recognize a face. 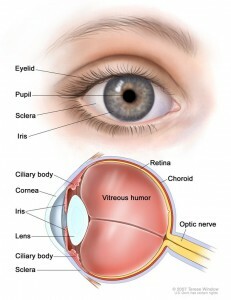 The surrounding part of the retina, called the peripheral retina, is responsible for your side or peripheral vision. After being exposed to high sugar levels for a long time, the blood vessels in the retina develop some weak spots. Often bulging out like bubbles along the blood vessels these are called microaneurysms. Sometimes the microaneurysms rupture and blood spills into the retina to form small dot hemorrhages. Your retina will eventually clear the blood away, but some debris is often left behind. These clumps of debris are called hard exudates. Most people with diabetes get these small changes in their eyes after having diabetes for 10 years or more. Background diabetic retinopathy is a sign that your retina’s blood vessels are sick. If enough of the blood vessels rupture, the retina may not receive enough blood to keep it healthy. With Background Diabetic Retinopathy damaged blood vessels in the retina begin to leak extra fluid and small amounts of blood into the eye, sometimes spilling enough blood to fill up the eye. When many of the blood vessels in the retina close, preventing enough blood flow this is called Proliferative Diabetic Retinopathy. In an attempt to supply blood to the area where the original vessels closed, the retina responds by growing new blood vessels. Proliferative diabetic eye disease is less common than background diabetic eye disease, but is much more likely to take away some or all of your vision. If it is caught early proliferative diabetic eye disease can be treated with laser therapy to save your vision. Once the vision is lost it is very hard to get it back. Background and early proliferative diabetic retinopathy have no symptoms. The only way to know if you have these changes and need laser therapy to save your sight; is to visit your eye doctor regularly. People with diabetes should have their eyes examined at least once a year to make sure they do not have early damage that threatens their vision.